Eldrad was a silicon-based lifeform sentenced to obliteration by the Kastrian people. All that remained was a hand which fell to Earth. 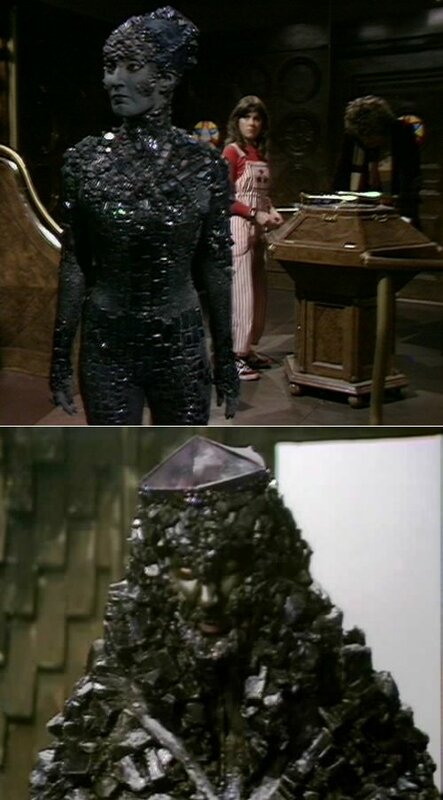 One hundred fifty million years later, the Doctor’s friend Sarah Jane Smith discovered it in an English quarry–one of the few times that the show went on location to a quarry because they actually needed to show a quarry and not an alien world. The fossilized hand sported a chunky ring which contained Eldrad’s intact consciousness. Possessed, Miss Smith was forced to carry the hand to a conveniently-located nuclear reactor. Eldrad absorbed the radiation and regenerated into a form allegedly modeled on Sarah’s physiognomy, a pebbly femme fatale with glowing blue eyes. Appealing to the Doctor with a tale of wrongful punishment, Eldrad was transported in the TARDIS back to Kastria, where she seemingly was killed by one of the booby-traps left behind to prevent her possible return. Reborn into a new body, Eldrad assumed his true form–a male Kastrian. A bit disappointing, really. So few women break into the field of interstellar conquest. *Several others appeared late in the show’s run, among them the Rani, Morgaine, Helen A and Lady Peinforte.